Things are moving along well and on time so far! Here are some photos Christopher took at the end of last week. 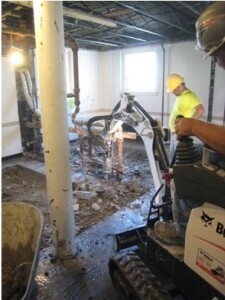 The bathroom floors being removed in order to install new plumbing. 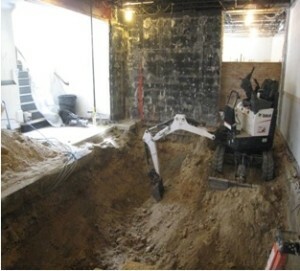 The bathrooms without a floor. 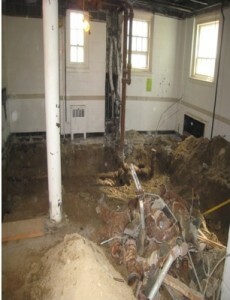 You can see parts of the old plumbing which is being removed and replaced. Lots of dirt is being removed from the floor in the “mezzanine” area near the former coat rack (which was on the black wall) to lower the floor to the Great Hall level in this area. 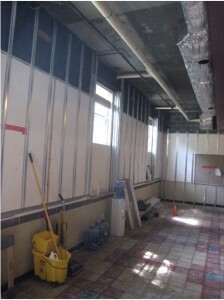 New wall installation going up in the Great Hall — no more cinderblock!